Welcome to your own tropical paradise on the North Shore. Perfect for a romantic getaway. This is the ultimate beach house with, 'rain forest' granite, and hand made copper sinks. The house has a large master suite with a private lani and a King bed. The living room has a queen sofa that can be made into a bed if you need a little extra sleeping space. World renowned Tunnels Beach is just a short walk away. Perfect for a quit walk or a quick swim in the warm waters of the pacific. The beach is a magical spot to watch the sun rise or set, If you want to be active there are endless things to do, or you can curl up with a good book and relax. 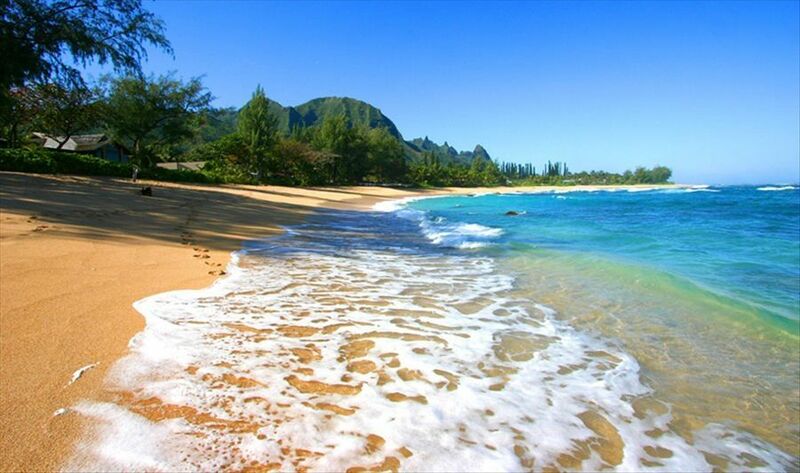 There is a Bar-b-Que for grilling or the historic town of Hanalei is 10 minutes away. Hanalei offers an array of restaurants, and boutiques that appeal to the most discriminant of foodies and shoppers. Our home is located two houses off of the beach. It offers a large yard and tropical garden. There is an outdoor shower that is great for rinsing off after a hike or swim. The house is fully equipped with every thing you need including a washer and dryer. Linens, bath towels, and beach towels. Enjoy the beautiful mountain views from the Lani. Seasonal snorkeling and whale watching, surfing or shell collecting are favorites of our guest. The house can also be rented with VRBO Listing #175066 which is a three-bedroom private home also on the grounds. We would be happy to answer any questions you have over the phone, however please not the time difference! We are on Hawaii time zone which is 3 hours behind Pacific Standard Time. We would be happy to answer any questions you have between the hours of 8 AM and 5 PM Hawaii Standard Time. Jeff can be reached at 808 482 0031. Let me start by saying that this is a lovely home. It was, up-to-date, clean, and it was only about a 7-minute walk to the nearest beach. We appreciated the beach chairs and cooler that was provided. The games and puzzles offered were also a nice touch. One of the major downsides of this home is that it is VERY close to another home located on the same property. If someone so much as coughs in the other home, you can hear it - especially since there's no way to close out the noise from the windows. The windows are screens with shutters that can be opened and closed. We were lucky that the family that stayed in the other home for the majority of our time there was incredibly quiet. However, I could see how this could end up being real nuisance if we hadn't gotten so lucky. One of the main reasons we chose this home over others was for the view from the balcony off of the bedroom shown in the photos within the listing. We were very disappointed when we arrived and saw that the view was not at all as advertised. This photo in the listing must be old, as the view is now at least 80% blocked by overgrown foliage. We were surprised to find that although the kitchen is quite large, it's somewhat lacking in kitchen equipment, and only salt pepper, and a small amount of olive oil is provided for cooking. While I didn't dock my rating for this, I think it's worth noting. Most VRBOs with a full kitchen tend to offer a variety of spices as a courtesy. We contacted the owner in advance of our arrival, requesting a late check out due to our flight time. We never received a response, even after following up. There was a mudslide that blocked our exit the day we needed to leave. Even then (after contacting the owner yet again), we still did not receive a response about whether we had to leave the rental by the check out time or not. We finally got ahold of someone else through another number that morning though. The lack of communication was frustrating. Overall, it's certainly a nice place in a good location, but for the price, I think there are better options available. I don't think I would stay here again. We enjoyed the property and the home! No closeable windows mean you can hear everything going on in the 6 or so units within 60 feet or so. Windows super dirty, no wipe downs on fixtures, window openings. A rodent turd next to the sink. Coffee maker present but no filters. Cheap dollar store utensils and lacking many staples of VRBO's I have stayed in. Must have been the rats nibbling off the sea almonds and banging off the roof ALL NIGHT LONG. Romantic? Love this property - have had the pleasure of staying in both houses on this property. My girlfriend and I traveled to Hawaii for my 30th birthday and fell in love with the island and this little bungalow on the North Shore. Secluded and quiet, it had a great kitchen with close proximity for exploring the Nāpali Coast, Hanalei, and Princeville. Only drawback was the electricity in the bedroom; it didn’t work. We tried flipping the breaker to no avail, but it was never a big deal since we were exploring all day anyway. The place is tucked away behind a bigger house, but we still felt as though we had our privacy. We would definitely stay again! My wife and I spent 6 nights in the Treehouse and loved it. The house was everything it was advertised to be. It was spotlessly clean when we arrived and was well furnished and equipped with everything we needed. We cooked some great meals in the well-equipped kitchen. We also enjoyed the very short walk to Tunnels Beach. The house even had beach chairs, a beach umbrella, an ice chest and beach towels - so we were well-equipped to spend quality time on the beach and so close that we never worried about finding a place to park. We liked the quiet pace of the North Shore. Old Hanalei town was only a 10 minute drive away for groceries and shopping. All in all, this was just what we were looking for in a vacation rental. We were a little worried at first that the house was not air conditioned. However, we acclimated quickly and realized we didn’t need it. There were ceiling fans in every room plus some extra fans to keep air circulating. Nights are cool and comfortable. The living room has a large skylight that is neat, but it does cause that room to warm up quite a bit in the afternoon. We were usually out and about during the middle of the day, so that really was not a factor for us. Tour Kauai by helicopter and see the beauty of the island from a unique perspective that will take your breath away. CANCELLATION POLICY:	1. Deposit will be forfeited if less than 90 days written notice is given. 2. Rent and taxes will be forfeited if less than 60 days written notice is given. 3. Rent, taxes and clean fee will be forfeited if less than 30 days written notice is given. 4. Cancellation processing fee of $100 will apply to all cancellations. 5. Beachin kauai, unilaterally and at its sole discretion, reserves the right to change or cancel the above reservation for any reason. If we cancel your reservation you will receive a full refund of rent, taxes, and security deposit.